Today the GOLD PRICE posted a very rare unchanged price on an $8.00 range, ending at yesterday’s $1,080.80. SILVER scraped off 2.1 cents to $14.203. The five day chart shows a spike yesterday to $1,073, slap at the July low at $1,072.30. Here’s a chart that shows both bottoms, Also, glance at the RSI and look at how oversold gold is. I’m crawling out on a limb a-swaying in the breeze, but the GOLD PRICE is primed to turn up here. After 13 down days — aw, maybe there was an upday in there someplace, but not to amount to a hill of beans — it is ready to turn around. Interest in it is plumb dead. Trading is comatose. Ain’t 13 days enough for all the croakers to sell out? I bet it is, so I would start buying gold. What might stop you? All those folks talking the price of gold down to $1,000 or even $750 and telling you to hold on to your Federal Reserve notes because the Fed always wins. Right, like it did in 1930. Anyhow, some kind of gold price bounce is way overdue. If it was a lady, it would be an 10 month pregnancy. As I have been whining for days, silver’s 5 day chart shows no pattern, just sawing back and forth lower. Today it reached a new low for the move at $14.14 with a 21 cent range. 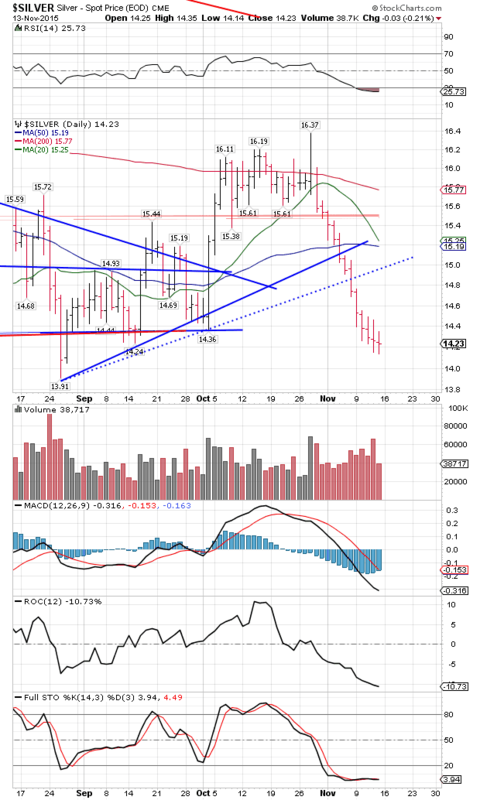 Silver’s as washed out as the gold price is, and washed out means, “Where will more sellers come from?” Maybe it will surprise me and waterfall past the August $13.91 low, but not till after a rally. I ain’t near about finished yet, so just hold on. 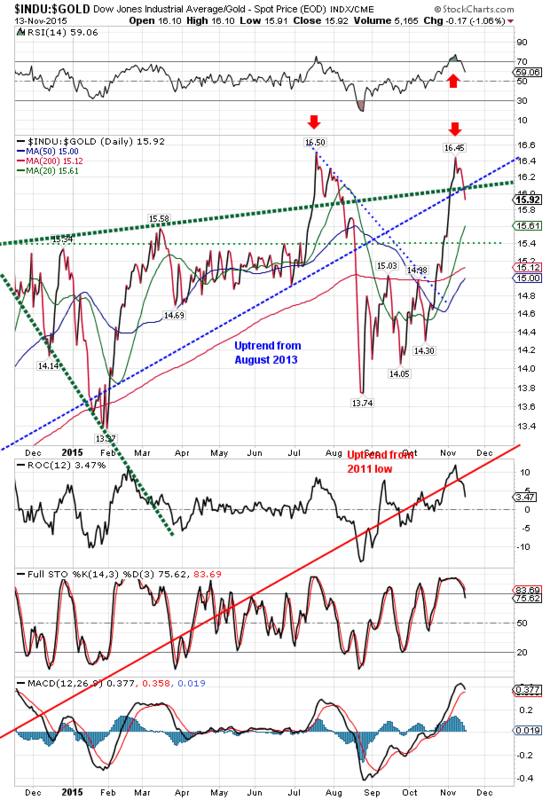 The GOLD/SILVER RATIO has acted right positive. This last week it made a new high at 76.50, but if silver and gold prices were about to fall to the earth’s core, as some would have us believe, why hasn’t that ratio already busted up through 78? Why has it put in successively lower highs? This points to a weakening of the metals’ weakness. Durn, what’d I say? I reckon that means they’re growing stronger. Been listening to central bankers and Nice Government Men so long I’m beginning to talk like ’em — have mercy! I ain’t thru yet, so hang on. The Philadelphia Bank Stock Index mirrors confidence in the banking system, the opposite of what drives silver and gold demand. BKX goes up, gold goes down, and vice versa. Therefore when the BKX is rising, gold’s future darkens. Look at this chart on the right, gold divided by the BKX. Remember, when gold is stronger the chart will rise, when BKX is stronger the chart will fall. I forbear to cover that action in August again, ’tis so bogus. Just move on over to recent price action, where you will notice a right smart gap down on 6 November. Looks like an exhaustion gap signalling the move’s end, but needs to rise from 14.70 now to above the 20 DMA (15.37) to confirm. Confirming that the spread’s down move has ended is the BKX itself, which crashed through its 200 DMA and 20 DMA today. More, the $BKX has been losing ground against the S&P500 since July. During this November surge banks briefly found favor and broke through the downtrend line, but are now poised to crash through that floor. I’m nearly through. Bottom line: I believe that silver and gold prices have posted a double bottom between the summer and November lows that marks the last bottom in the post -2011 correction. The Fed’s recent noises about raising interest rates in December have set itself and markets up for extreme disappointment. For all their bear market rally volatility, the stock market bull was shot graveyard dead in that summer break, and ain’t coming back. Disappointment in the monetary “authorities” and stocks will boost demand for silver and gold. Watch — the low for silver and gold prices lies in November. Stocks knocked that 6-week winning streak in the head with a 3.6% down week. That, he chortled, reversed the Dow in Gold and Dow in Silver, leaving behind double tops. 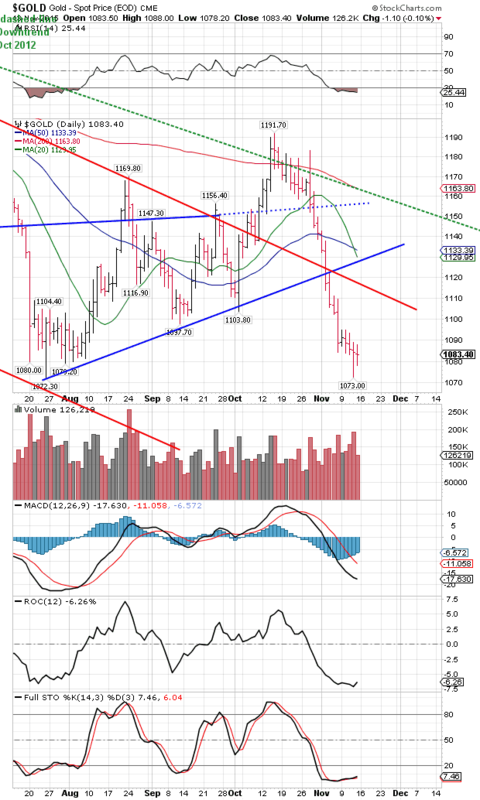 If it was not the week from hell for silver, it was the week from some place next doorl. Gold flatlined, even closed today unchanged. US dollar index failed to make good any earlier gains and has put in a top for a while. Will probably continue rising, though. Platinum and palladium were nuked this week. Palladium has lost nearly all its gains since the August low. Platinum/Gold spread now stands at its lowest since 1985 [sic]. After stock markets closed in the US today three gunfire attacks broke out in Paris, which threw futures markets further down the hill. I’m sure that didn’t help the euro, either. Dow Industrials lost more than 200 points for the second day, down 202.83 (1.15%) today to 17,245.24. 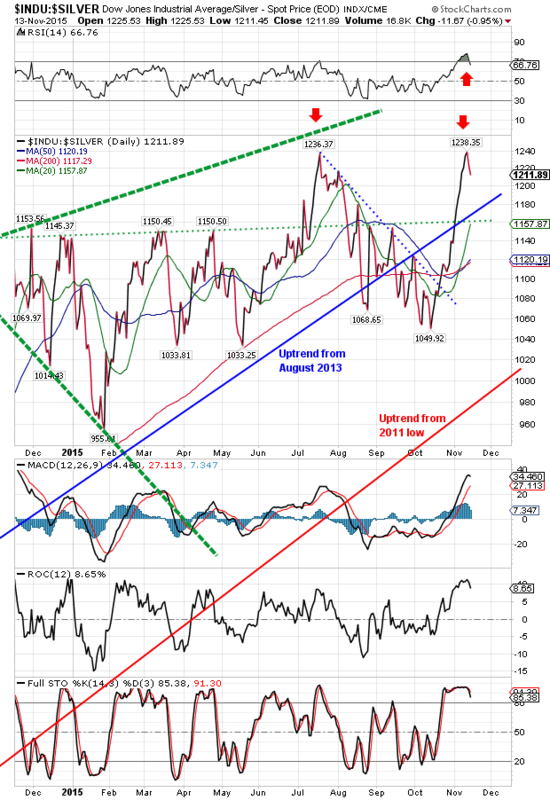 (Yesterday the Industrials lost 245.15 or 1.4%). S&P500 tumbled 22.92 91.12%) for a close at 2,023.04. 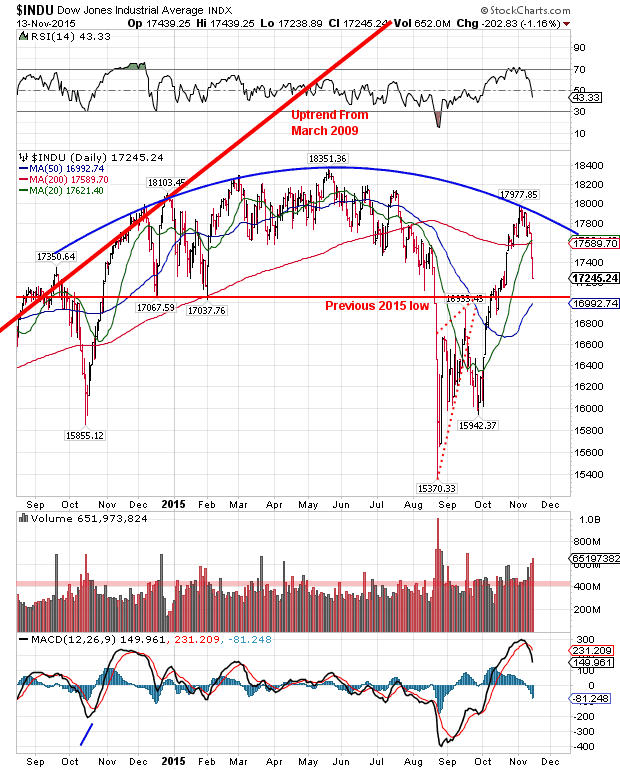 On both charts you will see the upside-down bowl topping formation, and how stocks rallied through the 200 day moving average (DMA) to the bowl’s bottom. Note that both charts show a collapse through the 200 and 20 DMAs now nearing the bowl’s lip — think of falling over a cliff. Aww, shucks. Did I forget to mention to y’all that volume has been rising with the decline, reinforcing it and forecasting more of it? Also the MACD turned down this week and the RSI is below 50 and diving. Now, the backdrop: Upside-down bowl top forming for a year with a breakdown this summer. 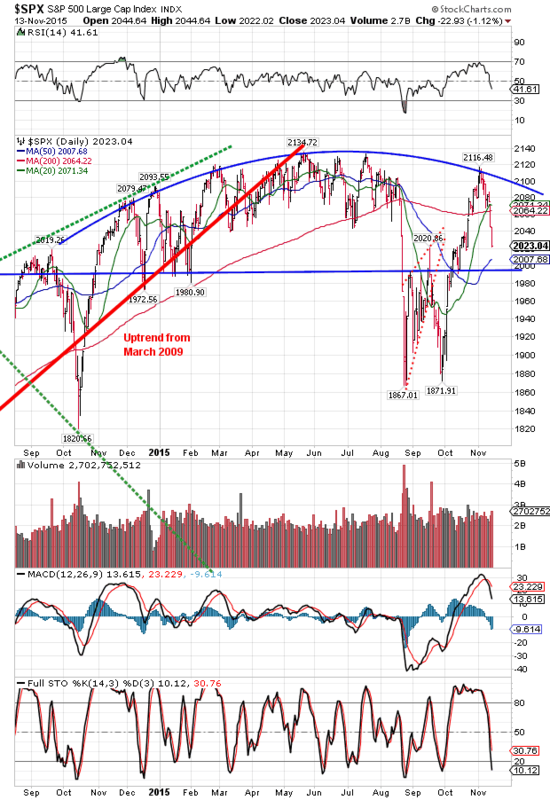 Conclusion: Bull trend since 2009 has broken and will fall for several more years. Confirming that outlook are the Dow in Gold and Dow in Silver. Dow in gold shows a double top July and this week (red arrows), coming off a severely overbought RSI, other indicators agreeing this is a top. Double top posted at 16.50 troy ounces and 16.45 troy ounces. The Dow in Silver agreeth thereto. Double tops at 1,236.37 and 1,238.35 troy ounces. I’ve been expecting that the dollar high we saw on 10 November marked the end of the advance begun 16 October and thus the start of a correction. 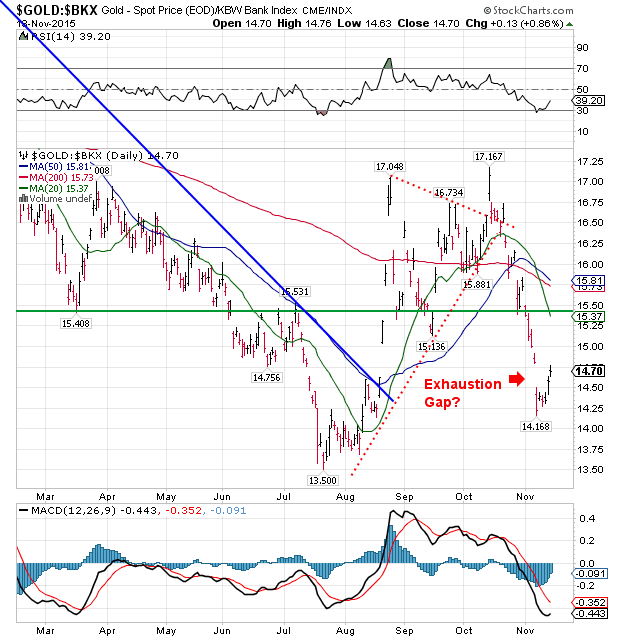 The trend has been down since 10 November, although the dollar rose 30 basis points today to 99.01. A 50% correction would take the scurvy dollar index back to 96.70. Unless it seriously wounds that line and falls further, expect more dollar upside into next year. Poor euro, poor yen. Euro lost 0.61% today to end at $1.0752. Never mind the Europeans are already committing economic and demographic suicide, now their currency is about the pay the price. It broke down out of a 4 month consolidation and in so far as the chart speaketh, it speaketh doom. Look for a WAY lower euro. May get a countertrend rally while the dollar corrects, but count not on it lasting. Yen also broke down out of a trading range, and will probably move lower, but is managed so minutely by the Bank of Japan and the Japanese Nice Government Men that they will probably keep it from falling through lows from earlier this year at 79.5. Flatlined today and ended at 81.52. Yield on the 10 year treasury note reached all the way to the downtrend line from 2007 [sic] but could not pierce the line and hold. Expectation of the Federal Reserve criminals and miscreants raising rates in December is pushing up the yield and the scurvy dollar. Is there a train wreck coming down the tracks?